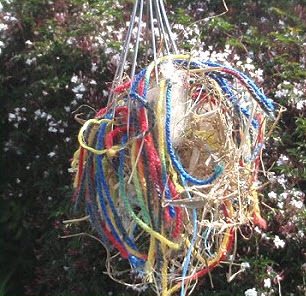 Turn a kitchen whisk into a dispenser for nesting materials for your neighborhood birds! Get a whisk and tie a string to the loop on the end of the handle or glue the rope around the handle if there isn’t a loop. Stuff nesting materials into the whisk, such as pieces of yarn or string, strips of paper, cotton balls, or pet fur. Hang the whisk in a tree or somewhere the birds can easily access it.